In the telling of the story of the Good Samaritan, Jesus asks, “Which of these three do you think was a neighbor to the man who fell into the hands of robbers?” Just three? I count four men in this story who had the opportunity to care for this man who was attacked. What about the innkeeper who, although recompensed, was to care for him? Was he a good neighbor? We don’t really know. The story does not tell us if he actually cared for the man or if he turned him out on the street to die after the Samaritan left. What would you do? Are you a good neighbor? Are you your brother’s keeper? We are overjoyed when we witness random acts of kindness for those in need. Service to others in need, whether compensated or not, is what makes for a good neighbor. Both those who are paid for their services and those who are not, should love and care for those whom they serve, as they would wish to be cared for. 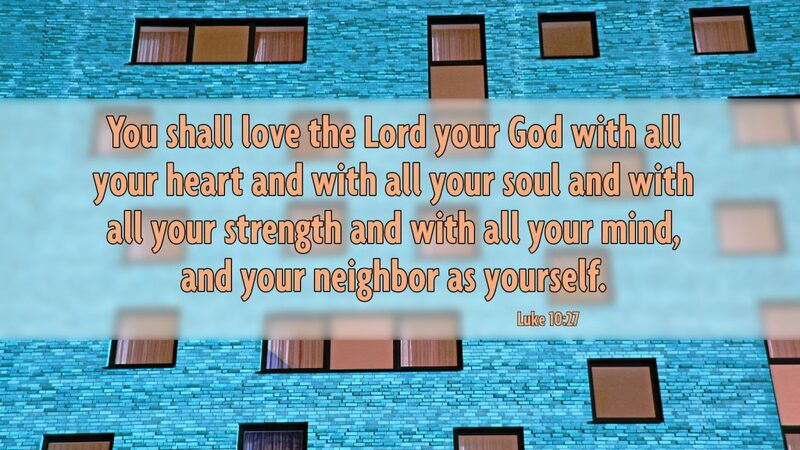 Prayer: God help us to love the Lord our God and to love our neighbor as ourselves. Amen. Today’s devotion was written by Judy Mattson, NALC pastor of Christ Lutheran Church in Bunnell, FL.